This towering flow of water is one of Yosemite’s best known waterfalls, accessible on the ground by a moderate hike. Its volume depends on the season, though it generally runs year-round. Depending on the amount of water, there is either one massive waterfall or several smaller strands falling across the rock to the valley below. Vernal Fall flows from the Nevada Falls above before plunging over the rock. The waterfall is about 317 feet tall, so it’s impressive (and often a bit damp) standing right at its base. Aside from the water there is often lots of greenery surrounding the falls, which adds to its scenery. The falls also produce a fine mist that can create rainbows. 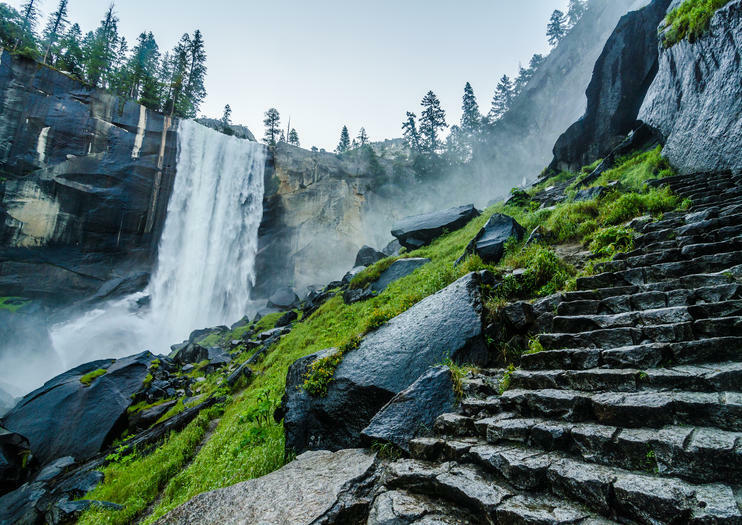 The steep hiking trail that leads to Vernal Fall is mostly rock steps, but the views are worth the climb. There is also plenty of natural scenery, of Merced River and Yosemite Valley, to enjoy on the way up. If you’d rather see it from a distance, Vernal Fall is also visible from the Glacier Point overlook. Get acquainted with the landmarks and highlights of Yosemite National Park during this 9-hour day tour from Fresno or Oakhurst. Travel into the Yosemite Valley through the Southgate, then spend the day viewing and photographing some of the valley's best features such as Bridalveil Falls, Half Dome, Yosemite Falls and Yosemite’s high country. Hike down the 4-Mile Trail (during the spring to fall) or choose to remain on the bus. Lunch will be provided and can be eaten along the trail. National Park entrance fees included. Explore Yosemite National Park on this day hike from Glacier Point. Led by an expert guide, hear about the park’s natural features as you journey past three famous waterfalls: Vernal Fall, Illilouette Fall and Nevada Fall. Take in stunning views of Half Dome after a shuttle ride to Glacier Point and, from there, begin a moderately strenuous 8.5-mile trek on foot. Travel down to the valley floor and soak up the scenery of the Panorama and Mist Trails. This small group tour runs from May to October.